I came across this super simple rustic bench design from a magazine that my wife’s parents gave me. It’s called an “Aldo Leopold Bench”. Named after Aldo Leopold, a famous environmentalist. It looked like something I wanted to build and quite simple, too. There are various designs for the bench. 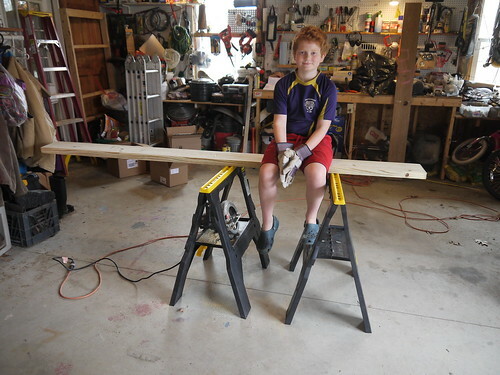 Mine used 2×8 lumber and called for two boards per bench: one 8-foot board and one 10-foot board. The seat and back were made from the 8-foot board. 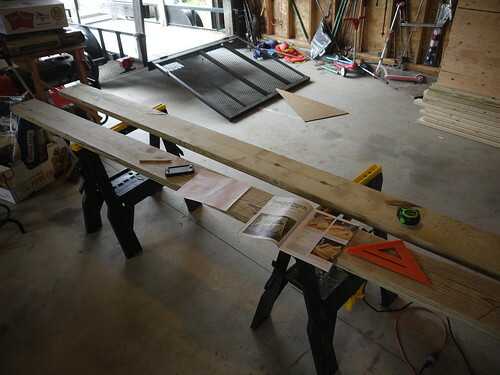 I cut that board into a 49½-inch piece and a 46½-inch piece. That’s a single cut and maximizes the usable wood. The seat is 3 inches shorter than the back because it sits inside the legs (each 1½ thick). 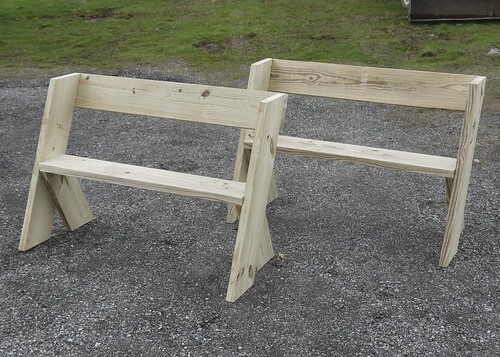 The legs consist of two identical longer leg sections (which also form the sides of the bench) and two identical shorter leg sections. 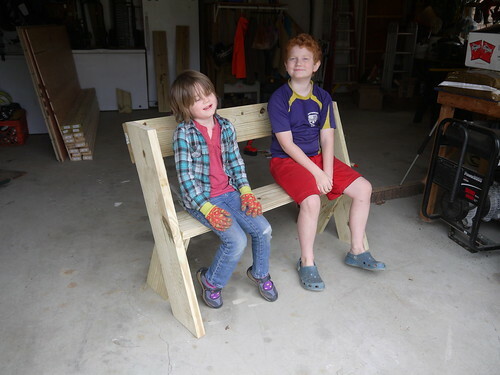 In my bench, the longer legs were 36 inches long and the shorter legs were 17¼ inches long. With my speed square I marked out 22½-degree cuts on each end. It was a cinch. Everything is then laid out and screwed together. Once the cuts are made, it’s almost impossible to put it together wrong. Just make sure the legs mirror each other. Ended up making two of them. These are destined to live at the pond near where I’m going to put a new duck house I’m building (more on that later!). We liked them so much, I think I’ll make another one for the garden and a couple for the fire pit area as soon as I get a chance. 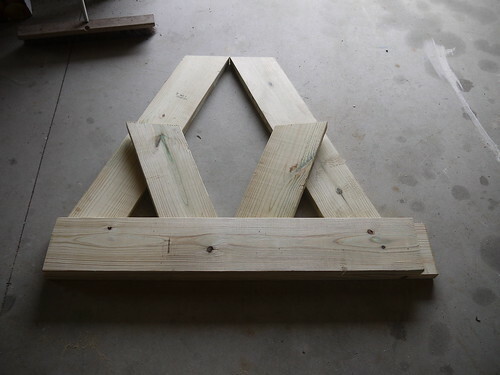 Mark one end of the 2×8×10 at a 22½-degree angle with a speed square. Then cut with a circular saw. Make a mark 36 inches away and repeat the cut at the same angle. Cut the remaining front leg and two back legs from the same piece (two 36-inch pieces and two 17¼-inch pieces). 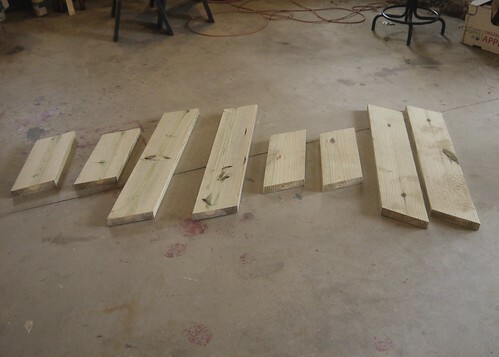 Cut the seat and backrest from the 2×8×8 (one 49½-inch piece and one 46½-inch piece). Fasten the legs together. Stack the seat and backrest as guides and then align the legs against them. Fasten legs together with three 2½-inch screws. Attach the seat and backrest. Stand the two ends up and screw the seat in place. 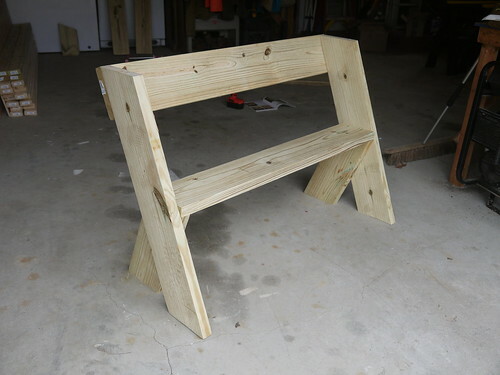 Lay the bench down and attach the backrest with screws.